Aber Cottage Guesthouse07976 518687work Guest AccommodationCaroline and Kevin would like to welcome you to their home in the picturesque market town of Dolgellau situated in the heart of Wales' beautiful Snowdonia National Park. 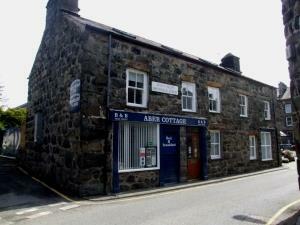 Aber Cottage is a traditional stone cottage, and listed building, with modern en-suite facilities to all rooms, with TV, free wi-fi and complimentary tea and coffee. Car parking, one per room, is in our own private car park with secure access. We are ideally situated in the town and within easy walking distance to excellent restaurants, inns and local shops. The guest house is superbly situated near to the mountain of Cadair Idris, the Mawddach trail, and many other walks. Coed-y-Brenin, with its popular forest trails and one of the leading mountain bike centres in Europe, is also nearby. Dolgellau is surrounded by spectacular landscape and if you fancy a visit to the coast, the beautiful sandy beaches of Fairbourne and Barmouth are only a few miles away. Hikers, climbers, mountain bikers and other adventure pursuit guests are all very welcome and we have secure storage for your equipment. Aber Cottage is over 250 years old and due to the nature of the building, it may not be suitable for children under 8 years, or for those with limited mobility.